Une vacation à Paris is sheer bliss. 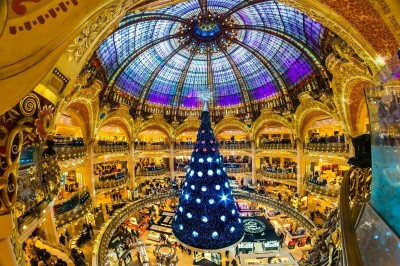 And a Christmas in Paris can be better still. No tourists, no lineups, just the pure joy of living as Parisians do. At this time of year, the only real visitors appear to be citizens of France doing their Christmas shopping in the glowing and twinkling City of Lights. To help you get the best out of a truly luxury Christmas in Paris, we’ve put together a few of our favourite things to experience over the holidays. Joyeux Noel in Paris, my friends! Paris is indeed a city full of lights, and even more so at Christmas. Everywhere you look, store windows and restaurants beckon with beautiful and unique displays, with each arrondissement lighting their streets and neighborhoods with distinctive seasonal adornments. In early November, the historic department stores of Paris unwrap their highly anticipated holiday window displays with their sparkling lights, magical soundtracks and animated characters. These unveilings are perhaps one of the best parts of spending the holiday season in Paris, especially the famous Christmas windows of the Galeries Lafayette Haussmann. Start your shopping day outside of the store with a private viewing of each animated window: last season’s spectacular displays featured hand-made, animated paper polar bears and penguins. This season, Galeries Lafayette invites us all to re-discover the magic of Christmas and reawaken the child within us with a tasty confection of a Christmas Tree, soaring to the top of the store’s famous stained glass dome. Their windows invite us to an animated fairground where we can follow the antic courtship between the hero Pierre, a lovesick pigeon, and his sweetheart, the gentle dove Coco, throughout the spectacular series of carnival windows on Boulevard Haussmann. Sponsored by top brands such as Dior, Evian, Gucci, Canada Goose, and Hermès, they are guaranteed to put you in a festive mood. Once inside, continue your festive shopping experience with the VIP Treatment and indulge your Christmas luxe with the store’s Personal Shopper experience that includes a separate waiting area and individual fittings, change rooms and luxurious pampering (not to mention bubbly flutes of champagne). Be prepared to invest a minimum of €6,000 in your indulgent extravagance, though. Afterwards, take a break with a fantastic view over Paris and the Opera Garnier from your own private, clear ‘igloo’ on the tellement chic rooftop Le Cube Bar or take lunch on the first floor of the Galleries Lafayette Dome at the gilded Angélina. Also worth considering is a guided tour of the Illuminations de Nöel on the Champs-Élysées and surrounding streets, including the uber-glam Avenue Montaigne with a tour of Paris with Discover Walks. And while there, the terribly touristy Avenue des Champs-Élysées is worth the hustle and crush of crowds if only to view the magnificent cavalcade of Christmas lights that nightly caresses this grand shopping boulevard (try and grab a picture from the top of the Arc de Triomphe). There is also a full-on, ticky-tacky Christmas Market close to Place de la Concorde, fun to visit for its mulled cider and cream filled waffles. Paris is full of Christmas markets during the holiday season, so make sure to stroll through at least one in your arrondissements while visiting. When you step into the Jacquemart-André Museum, you are crossing the threshold of the private residence of a “Couple of Collectors.” Edouard André spent his vast fortune on acquiring works of art which he exhibited in his new mansion, built on Boulevard Haussmann and completed in 1875. In 1881, he married the well-known artist Nélie Jacquemart, and the two devoted their lives to collecting the extensive works of art now on exhibit in their residence. 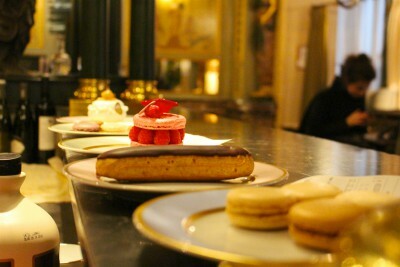 And nothing says Christmas in Paris quite like a Sunday brunch in their ‘home’. One of the essential meeting places in Paris for a delicious late breakfast, it’s a beautiful Parisian-filled nosh in an historic gilt and tapestry-filled setting. Try and arrive by 11am to avoid the line-ups as the café does not accept reservations. Afterward, view the many rotating exhibits of this petit musée, or see the private collection of this famous Parisian couple. We were fortunate to view the beautiful Ordrupgaard Collection exhibit, The Hansen’s Secret Garden, including works by Corot to Cézanne and Matisse. Also on display are the exquisite landscapes of Monet, Pissarro, and Sisley, along with portraits by Renoir, Morisot, and Gonzalès. The works of emblematic artists such as Degas, Manet, and Courbet, will also be exhibited, ending with a finale devoted to the art of Gauguin on view until January 22nd, 2018. A personal favourite and a must-visit, whatever the season, is Lionel and Dominique Michelin‘s De Vinis Illustribus, a fabulous wine cellar established by Lionel in 1994. 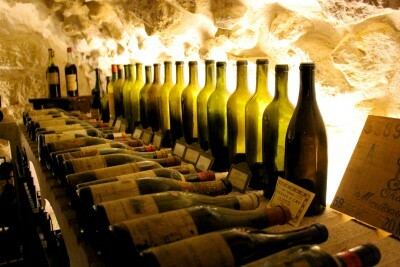 With a treasure trove of rare and vintage wines, this Left Bank wine cellar showcases Lionel’s passion for vintage wine – the oldest bottle dates back to 1811, and your host will regale you with stories of estate auctions and unique wine tastings. Lionel and Dominique offer wine lovers (including this one!) a one-of-a-kind, personal experience including tasty tastings (Mailly Champagne and an old Comté cheese), expert wine advice from a superb selection of vintages, to entirely curated dinners with tastings in their authentic cellar in the heart of Paris’ Latin Quarter. During my last visit to Paris, I indulged in Lionel and Dominique’s extraordinary hospitality twice and purchased two bottles of the tasty Mailly Champaign for my New Years Eve celebrations. Looking for the perfect, unique Christmas gift for that oenologist on your list? Consider one of Lionel’s special ‘anniversary wines’, a vintage wine corresponding to the year the person was born. Off the beaten path and worth a visit is the wander-full Les Passages Couverts de Paris. While many of these fascinating pedestrian walkways have fallen to neglect, but they are definitely worth a stroll through to view the unique shops, wine bars, petits-restos, and libraries anciens that were initially designed to give 19th century Parisian’s protection from mud and horse-drawn vehicles. There is an extensive network that runs from the Rue St-Marc, which includes Les Passages des Panoramas, all the way up to Le Passage Verdeau on the rue de Faubourg Montmartre. Keep your eyes open as their entrances are easy to miss, and many are closed nights and on Sundays. Our quaint studio rental, situated in the Passages des Panoramas, gave us a quiet, calm respite from the hustle and noise of Le Grands Boulevards and all the seasonal shoppers just outside. A must stop if you have never been to Paris should be at the Musé Carnavalet where you can view the entire history of the city from Medieval times, through the Revolution and on to the Second Empire. And while in the ‘hood, visit the Place des Vosges, Paris’ oldest square and perhaps the most typical example of Parisian life and history that remained untouched by Haussmann or the Modernists.